From the moment it opened, Cheer Up Charlie's was a flourishing pool of style and attitude. Night to night, it played hosts to many of Austin's subcultures but one of our favorite aspects of this club was its ability to incorporate fresh art and artists into its personality. The interior was splashed with playful illustrations by Matt Rodriguez while the outside featured an op-art mural by Carlos Rosales-Silva. And on any given night the club would rattle with the avant-garde performance art of such acts as Christeen, Air Jordan, and Total Unicorn. In honor of Cheer Up's east side location shuttering and moving to its new home on Red River, we selected seven other bars and restaurants that decorate and accentuate their establishments with excellent artwork. This quiet by day, rowdy by night drinking hole is adorned beautifully with the taxidermy creations of Austin artist Hope Perkins. Order a cheap shot and a beer under the watchful eyes of a gold-toothed bobcat wearing a pink bow. Or find comfort underneath a stag head painted with a beautiful nautical scene. You can also take your drinks outside and enjoy the mural painted by the Minnesota artist team Broken Crow. Besides excellent contemporary Mexican cuisine, this establishment also serves up delightful ambiance and décor. Interior designer Joel Mozersky had a great time filling the space with beautiful wood accents and Eames furniture. But upon entering the eye is immediately drawn to the large centerpiece mural done by the Sodalitas, a group of local artists comprised of Shea Little, Joseph Phillips and Jana Swec. Heading upstairs to the bar Malverde, you are greeted with the playful works of Cruz Ortiz. His textural prints mix in a bit of pop art that adds a signature style to an already cozy tequila clubhouse. Since the fall of 2011, the Frank "Art Wall" has livened up a typically boring stretch of Fourth Street in downtown Austin. From month to the month, the exterior wall of this hot dog joint is painted by local favorites including Jason Archer, Michael Sieben and Public School. They even farm out the project to talents from across the U.S. including the amazing Jeremy Fish. Make sure to keep an eye on this wall; it changes quicker than you think. If you have the privilege of eating in Austin’s latest Bon Appetit award winning restaurant, make sure that you have a look around before indulging in the fine dining. The atmosphere has been perfectly catered to the luxurious dinner crowd and the walls are graced with some of the finest in contemporary art. Sure the bar boasts elegant Texas landscapes and hunting trophies, but they are nothing in comparison to the large chromatic desert photographs by Barry Stone in the dining room. Not to be outdone, make sure to check out the enigmatic prints of John Chamberlain nearby. But perhaps the greatest work of art to come from Jeffery’s is the “giant onion ring." These two mobile eateries have one thing in common. 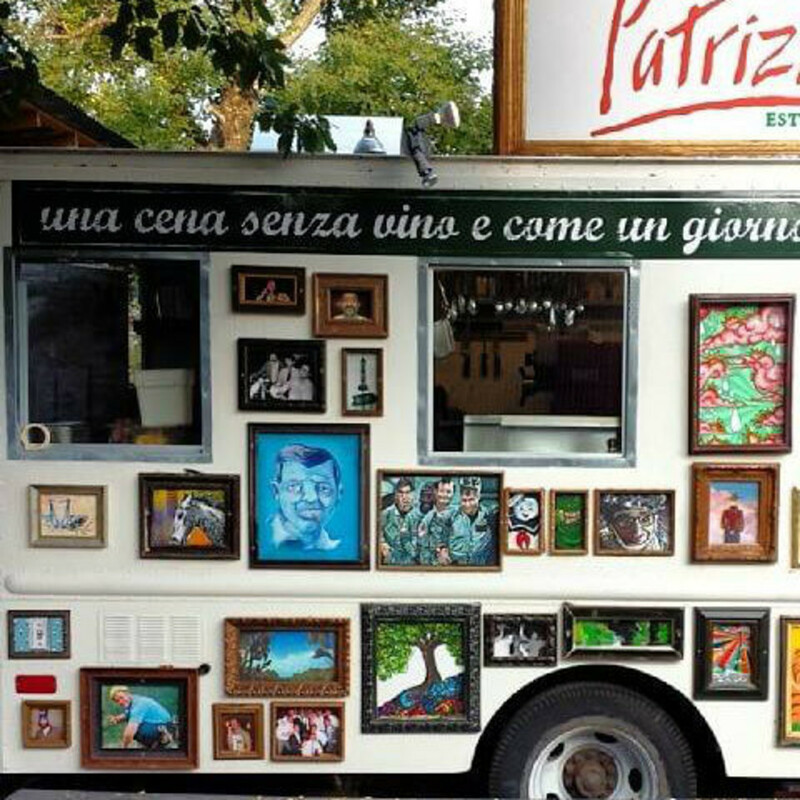 The owner, Nic Patrizi, offered up their exteriors for artists to paint anything they thought would accentuate them. The Jalopy is bedecked with some of the surrealist fantasies of artist Michael Peschka. 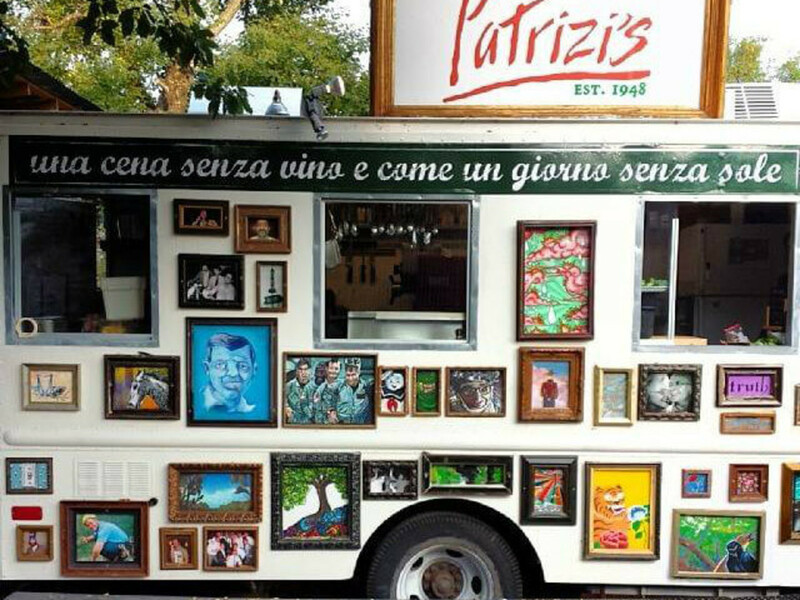 And Patrizi’s features some of the colorful animal portraits done by Liliane Avalos. But these are just two of the many vibrant artists that are featured in these spots. There is a lot to look at while you are waiting for a delicious pressed sandwich or unbelievable handmade pasta.